Wouldn’t you love to come home to this on your doorstep or better yet have it out on your counter all season long for a quick, easy and portable Cocoa Bar? When the kids were little I used the Wood Clementine crates for fine motor skills activity. You know stick straws, un-sharpened pencils etc into the holes. Now that my kids are older they usually just go into the trash. I found this one laying around the house holding some dog toys. Too useful for that. A little ribbon and you have the perfect gift idea for neighbors, friends, teachers or grandparents. Using this sized crate, I used 2 1/2 inch ribbon and hot glued it along the crate. Used a contrasting ribbon, because I had some, and created a box and hot glued it onto the ribbon. Easy enough right? Now what to fill it with. 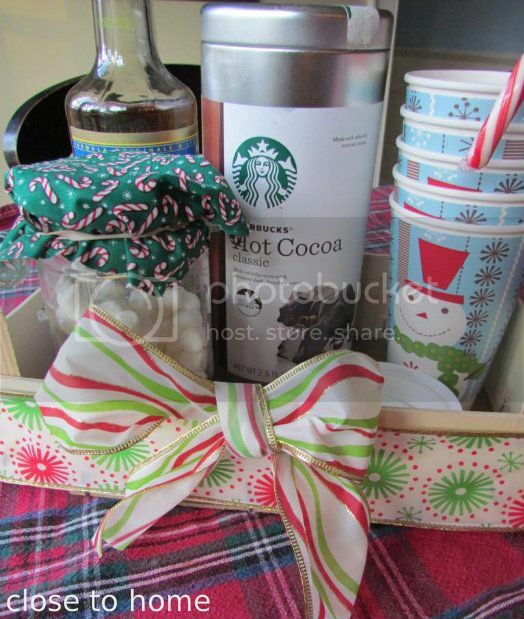 Really the crate makes a great starter to any gift theme. We have all these lovely Torani Syrups that I wanted them out to share with friends and family all season long. Cocoa–Homemade or purchased. You can add a bunch DIY Cocoa Cones as the gift. Extras like chocolate chips, crushed up peppermint, teas and coffees. Here is one that is packed and off as a gift. 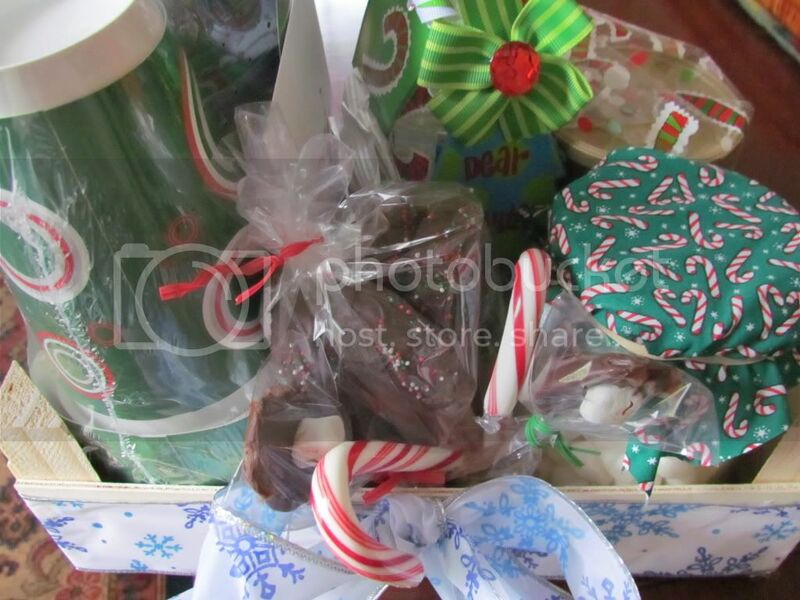 Added chocolate covered candy canes and spoons. We plan on keeping this one out all year by the coffee maker so I can add some yummy goodness to my coffee each morning. Anything helps! 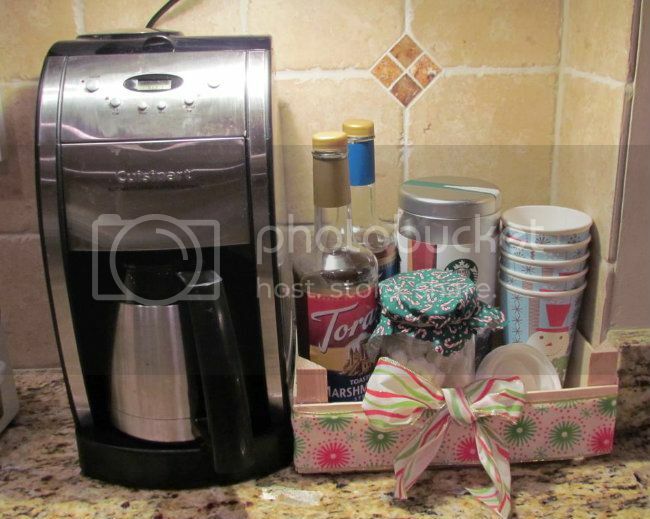 What would you add to your hot cocoa bar? This has become a very popular repin. Great idea!! The basket looks like it will travel well!! The Torani syrup is very versatile. I have used the pumpkin pie flavor on chicken breasts and it turned out very well. Yum, great idea! I’d add whipped cream and a chocolate spoon to mine! Such a great idea! 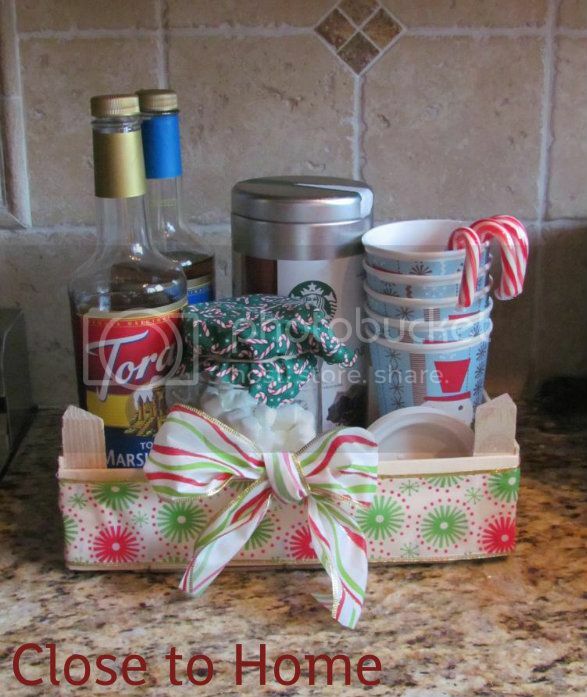 My daughter loves to add the holiday flavored creamers to her hot chocolate so if I were making a basket for her, I’d definitely add some of those! Your are so crafty- I wouldn’t have thought of that!! Very creative! That is too smart! I have a box of clementines just waiting for this project. Thanks for sharing! Love this! I think we might just have to make one. I would have to add the little marshmallows. We buy the colored ones in bulk and my kids love them. I love your creative use of that crate! Very crafty. We also love Torani syrups in our Hot cocoa. Makes a normal cup of yum into a Gourmet Cup of “Oh my stars I just went to heaven!” lol. I pinned – super cute gift idea! What a fantastic idea! I would love this! I think you added everything to it for wonderfulness!!! You just gave me an awesome gift idea! I’m not too crafty but this gave me some ideas 🙂 Thanks so much! Love the idea of a portable cocoa bar. You never know where holiday visit will take you!